Gaius Julius Caesar expanded the Roman Empire into a power that included half of Europe. According to legend, he was a descendant of Aeneas, the Trojan prince who founded Rome, himself the son of the Greek goddess Aphrodite or the Roman Venus. Julius Caesar grew up with many political connections through his father Gaius Julius Caesar, who had been a praetor, and his uncle Gaius Marius, a war hero and politician who had married his father’s sister Julia. 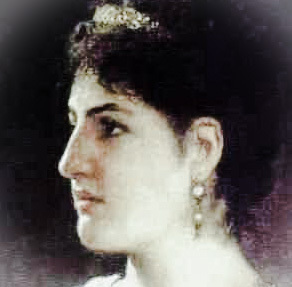 His mother was Aurelia Cotta. The politics in Rome were embroiled between those who wanted a populous electorate, the populares, and those who wanted aristocratic rule, the optimates. Caesar’s uncle Marius was a popularis. In his oposition was Lucius Cornelius Sulla, an optimas. Both were political leaders. These opposing political camps caused many civil wars, coups, and attempted coups. Caesar’s life, politics, and military career were directly affected by which camp was holding power. 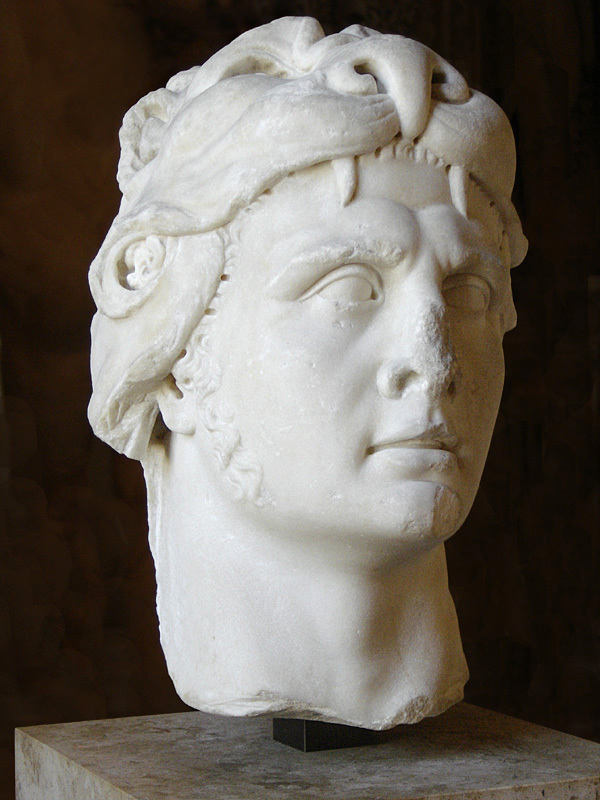 At this time King Mithridates of Pontus, on the south coast of the Black Sea, threatened Rome’s eastern provinces. Sulla was chosen to lead his army against Mithridates. 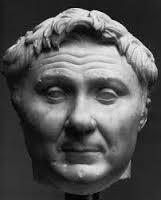 While he departed Rome to join his army, the government appointed Marius to lead the war against Mithridates. Sulla received word of this and marched on Rome and seized power. Marius fled to Africa. The appointment was returned to Sulla, and his army marched to the eastern provinces. Marius and his army then marched on Rome. He and his allies,including Lucius Cornelius Cinna, seized power. There was purge of the supporters of Sulla. 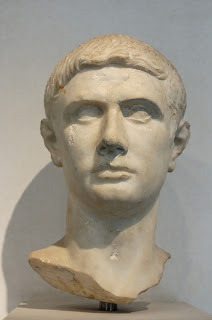 Marius died in 86 b.c.e., but his faction remained in power. Julius Caesar was allied with Cinna and married his daughter Cornelia in 84 b.c.e. Sulla was victorious in the east and marched on Rome. He waged war against the army of Marius and defeated them in 82 b.c.e. 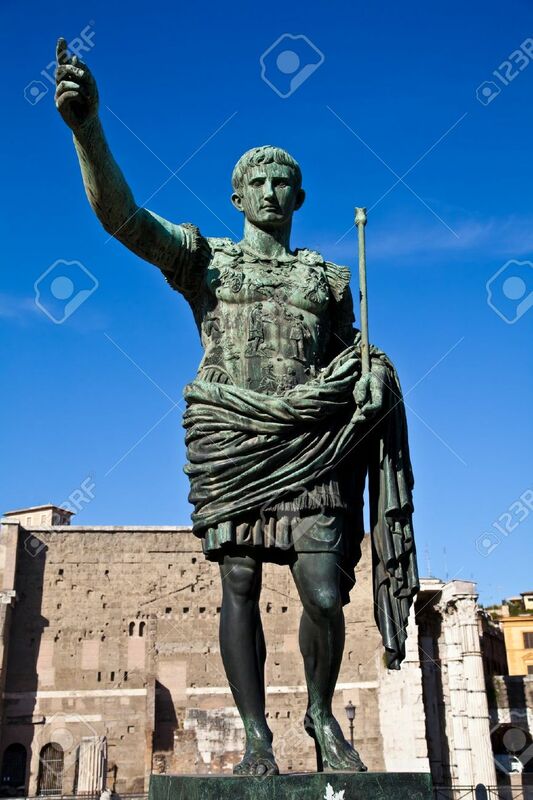 Sulla had himself declared dictator and initiated a massive purge of the populares. Caesar was on this list, being related to Marius and Cinna. Caesar’s political appointment, inheritance, and wife’s dowry was appropriated. He was in hiding but was reprieved because his mother’s family had influence with Sulla. Caesar joined the army and left Rome, and became an aide of the governor of Asia. There he was involved in a military victory against Mithradates VI, king of Pontus. In this action he was awarded the corona civica, or Civic Crown, one of the highest Roman military decorations. 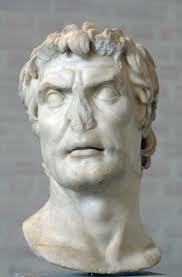 Sulla retired as dictator and died in 78 b.c.e. Julius Caesar returned to Rome at this time. Marcus Aemilius Lepidus, a close ally of his, had attempted a failed coup against the Sullan government. Julius Caesar sailed to Rhodes to study in 75 b.c.e. He was captured by pirates and ransomed for 50 talents of gold. Later, Caesar crucified the pirates. After this he again led an army against the king of Pontus. He went on to Rhodes to study under Apollonius Molo, who had taught Cicero. Caesar returned to Rome in 72 b.c.e., where he was elected as a military tribune. He then became quaestor and prepared to fulfill this position with the army in Hispania (Spain) in 69 b.c.e. He served as quaestor in western Hispania and returned to Rome and married Pompeia, the grand daughter of Sulla. He was elected aedile. After this Caesar was then elected pontifex maximus, the chief priest of Roman. He was elected praetor in 62 b.c.e. He was appointed propraetor in 61 b.c.e. and left Rome to govern Hispania Ulterior (Furthest Spain). In western Hispania he led the conquest of the Callaici and Lusitani people. His army hailed him as imperator, and he entered Rome in triumph. 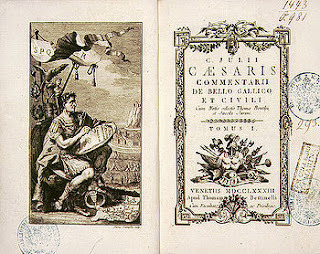 Caesar wanted to be consul, which was the highest office in the Republic, and entered Rome to run for consul in 60 b.c.e. In his campaign for consul of Rome, Caesar allied himself to Gnaeus Pompeius Magnus (Pompey the Great), a formidable military figure with a long term goal to get free land for his veterans to settle. Marcus Licinius Crassus, said to be the richest man in all of Rome, joined them in a three person political alliance for power. Caesar provided the political skills, Pompey the influence, and Crassus the money. 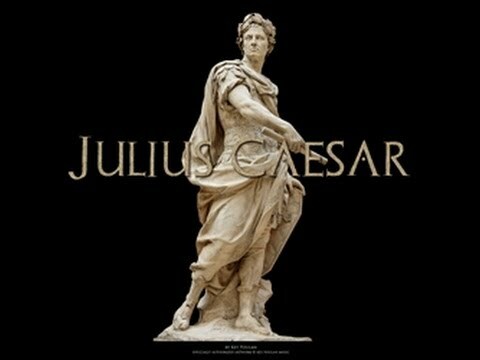 To cement the alliance, Pompey married Caesar’s only daughter, Julia. In the same year Caesar married Calpurnia, the daughter of Lucius Calpurnius Piso Caesoninus, who would be elected consul the year after. Their political opponents called their powerful political alliance “the three headed monster.” This was the First Triumvirate. In 59 b.c.e. Caesar won as consul, but his opposition, Bibulus, won the other co consul position. Caesar turned Pompey’s measures into law and pushed Crassus’s interests. Caesar became proconsul of Gaul in 58 b.c.e. His Gallic Wars lasted from 58 to 49 b.c.e. Caesar began with a lightning campaign in Helvetii (modernday Switzerland). The following year he conquered the Belgic confederacy (in modernday Belgium) and the Nervii. Caesar, Pompey, and Crassus met in Caesar’s province in 56 b.c.e. to renew their Triumvirate. By now Caesar had taken great riches in battle from the Gauls. By the end of 56 b.c.e. he had decided to annex all of Gaul (modernday France). Pompey and Crassus would be consuls the following year and promised to extend his proconsulship of Gaul for five more years. With this Caesar became even more ambitious. In the middle of 55 b.c.e. he planned an invasion of Britain. Caesar’s army marched to the river Thames and defeated a large force, capturing the fort of King Cassivelaunus and then returned to Gaul. Caesar’s strong political power base was waning, however, and his alliance with Pompey was weakening. Crassus received command of the eastern armies but was defeated by the Parthians, and he died in the battle. 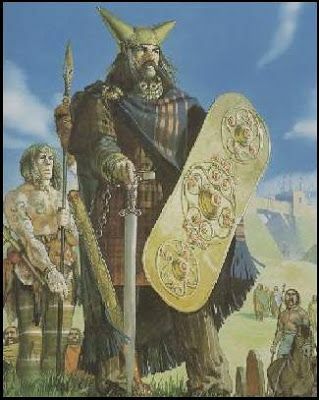 Gauls had united under Vercingetorix. In 52 b.c.e. Caesar decided to attack with a siege at Alesia, and 250,000 Gauls arrived to aid Alesia in fighting the Romans. The Romans held, and Caesar’s cavalry was able to surprise the Gauls from the rear, sending them fleeing. Alesia surrendered, and the population was enslaved. In politics, there was rioting Rome and with one consul dead (Crassus), Pompey served as “consul with out a colleague.” With Caesar’s siege of Uxellodunum in 51 b.c.e., Gaul was conquered. During his campaigns Caesar wrote seven books, which form Commentarii de Bello Gallico (Commentaries on the Gallic War). According to Plutarch, Caesar had conquered 800 cities and subdued 300 tribes. There are figures cited that he had 1 million men and boys become Roman slaves and left another 3 million dead on battlefields. Caesar was victorious as a general, but his political position was less secure. Pompey and Caesar were maneuvered into a public split, with Pompey now siding with the optimates. The Senate had ended Caesar’s term as proconsul and ordered him to disband his army and return to Rome. Without a government position he would face charges and prosecution. It was against Roman law for any army from a province to cross the border of the river Rubicon into Italy. By law this act was a rebellion against Rome. Caesar said, “Alea iacta est” (“The die is cast”), and led his army across the river toward Rome on January 10, 49 b.c.e. Caesar quickly advanced to Rome with only the XIII Legion. His opponents fled Rome. Pompey’s legions were stationed in Hispania. He and the Senate fled to Brundisium and sailed to the east. Caesar set up his own senate and was declared dictator by them, with Mark Antony as his equerry. He then declared a policy of clemency for all. Caesar tried to make peace with Pompey, but civil war was inevitable. Caesar knew that he had to lead his legions to Hispania, to prevent Pompey’s army from traveling to the East. With Marcus Aemilius Lepidus in charge of Rome and Mark Antony in control of Italy, Caesar set off for Hispania, where he defeated an ally of Pompey and his army. Caesar resigned as dictator and was elected consul. He then headed for Greece and on July 10, 48 b.c.e., attacked Pompey at Dyrrachium (modernday Durres or Durazzo, the main port in Albania). Caesar narrowly escaped defeat but smashed Pompey’s forces at Pharsalus in Greece on August 9. Pompey fled from Greece to Egypt, with Caesar pursuing him. When Caesar arrived in Egypt he was presented with Pompey’s head. An Egyptian army officer had slain him. Caesar is reported to have wept. Egypt was ruled from its capital city, Alexandria, by the Ptolemy dynasty, the descendents of the general of Alexander the Great. 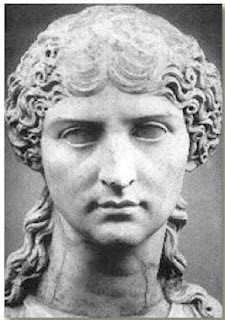 War had broken out in Egypt over who was to rule, between Cleopatra VII and her brother and husband Ptolemy XIII. Each had their armies and supporters. Caesar was smitten by Cleopatra’s great beauty. He led his army against the opposing army and deposed Ptolemy XIII. A romance between Caesar and Cleopatra continued for many years. Caesar spent the first part of 47 b.c.e. in Egypt, leaving to attack King Pharnaces II of Pontus. 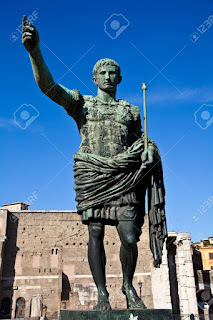 His victory at the Battle of Zela in May was so quick that Caesar sent to Rome his now famous message, “Veni, vidi, vici” (“I came, I saw, I conquered”). Evading the enemy fleet, Caesar reached the African coast and marched his army inland. Finally Caesar’s forces, estimated at 40,000, took on a depleted opposition of 60,000. In February at Thapsus he defeated them, losing only 1,000 men to Metellus Scipio’s 10,000. In May Caesar again returned to Rome in triumph. The sons of Pompey, Gnaeus Pompeius and Sextus Pompeius, were rallying forces against Caesar and had raised an army in Hispania. Caesar took a small force of veterans to fight them. Once in Hispania he quickly enlisted more veterans who had settled in the region after the Ilerda campaign. He amassed an army of 40,000 to that of Pompey’s sons army of 50,000–60,000 men. Caesar attacked in the Battle of Munda, on March 17, 45 b.c.e., and was able to drive Pompey’s sons’ men from the field. In September 45 b.c.e. Caesar returned to Rome, the unchallenged ruler of the Roman Republic, and was given the title imperator. In Rome, Caesar wrote his will, naming his great nephew Octavian as his heir and adopting him as his son. By 44 b.c.e. 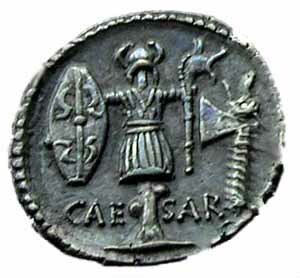 Caesar had been named dictator perpetuus. His opponents saw this as the end of the Republic and the political power of the aristocracy, and a conspiracy grew. 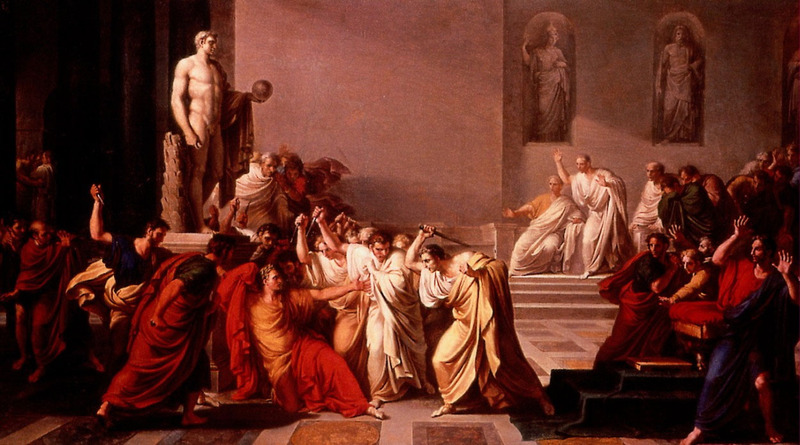 The assassination plans were for March 15—the Ides of March—when Caesar would meet the Senate. There were 20 men in the conspiracy. It is thought that Brutus went along with the assassination because he thought that Caesar would end the Roman Republic. Caesar entered the Senate, and hired gladiators blocked the outside door. Trebonius detained Mark Antony with conversation. As Caesar approached the senators, he was stabbed 23 times. 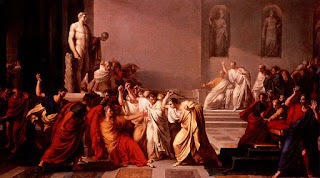 The murder of Caesar so enraged many in Rome that they eagerly listened to Mark Antony give a eulogy. Mark Antony and Octavian seized power and went on to avenge the death of Caesar, defeating the forces of Brutus and the chief conspirator, Cassius, in Greece before they fell out with each other. Two years after his death, Julius Caesar was formally declared a god as Divus Iulius (Divine Julius).